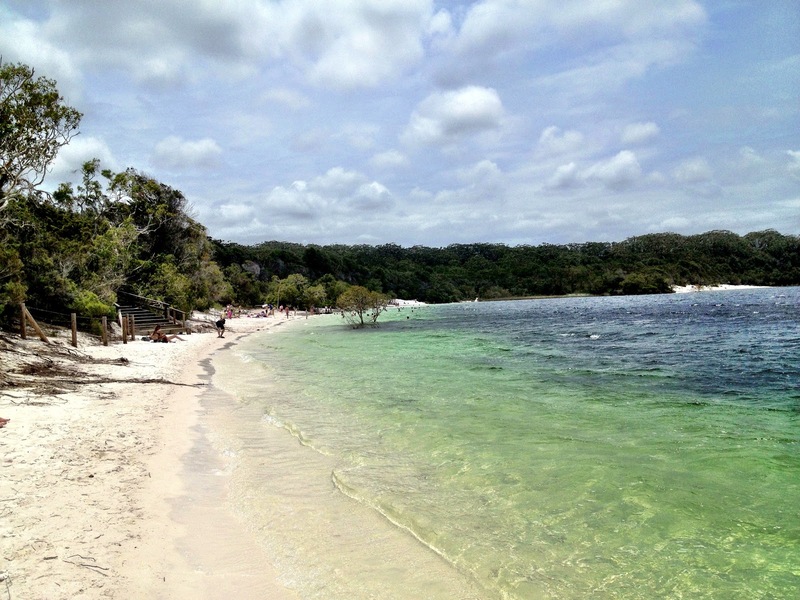 GUEST BLOG: Fraser Island has mass appeal for a multitude of reasons. In this guest blog, Simon from Simon's Jamjar - A Scottish-based digital marketer who's currently on a five-month odyssey travelling the world - fills us in on his recent Cool Dingo Tour and the six things on Fraser Island that left an indelible impression on him. We hope you enjoy! First things first. Fraser Island, located off the Queensland coast in Australia, is the largest sand island in the world. "See that steep fall down to your left? And the steep hill to your right? That's because we're essentially driving on the side of a sand dune". This was the voice of Tony, our tour guide from Cool Dingo. He's one of my favourite tour guides ever, and not just because he likes a bevvy. Hopefully you'll see why by the end of this post. We stepped off the ferry, and into a tough, rugged, German built, former military 4x4 machine. 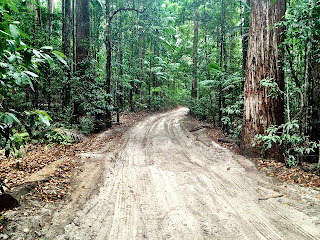 I'd heard Fraser Island was only possible to navigate by 4x4, but this beast was something else. "Ok guys, you're going to want to put your seat belts on for the whole journey, and I'm going to pester you to put them on after every stop. This island is damn bumpy, and I wouldn't want you hitting your heads on the roof and damaging my vehicle. Except you four. You can do what you want." We were only only minute into the trip and Tony (let's call him Mr. T) was laying down the law, targeting four young English girls sat on the back row. It brought a smirk to my face :). With seat belts on (the girls decided it was best to join everyone else), we were underway. Two minutes later, we leave tarmac for sand, and Mr.T engages four-wheel drive in the German tank. It's not called the world's largest sand island for nothing. 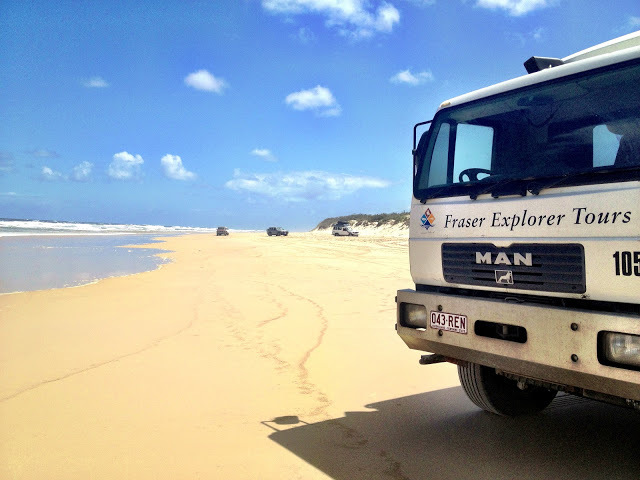 Awesome Thing Number 1 - Fraser Island is a 4x4 playground. All the tracks are sand only, and you can drive all the way up and down the beach. Some vehicles get stuck, then somebody else comes along with a tow rope and pulls them out. Such boyish fun. Our first stop after bouncing around the tank was Lake McKenzie. Many people have said you enter the lake and come out 10 years younger. Lake McKenzie is simply stunning! "Enjoy your swim guys, the pH level of the water is almost identical to that of the human body. So that means nothing grows in the water, so you won't get nibbled by fish, it also means you go into the water and come out feeling like you've had a shower and your hair has been shampoo'd". Sold. I swam for AGES. Back in the tank, Mr. T told us that he'd grown up with an Aboriginal tribe, and that gave him license to tell some awesome stories (only after we'd put our seat belts on). 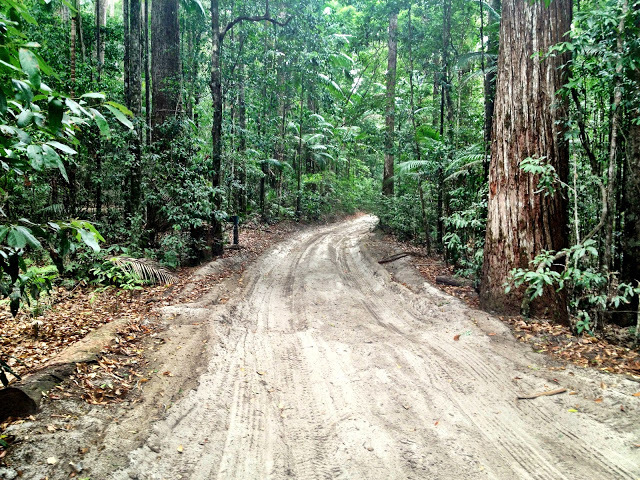 Awesome Thing Number 3 - Fraser Island has a significant Aboriginal heritage. The traditional owners of the island were the 'Butchulla' people. For various reasons however, Aboriginal numbers were down to 230 by 1880. But they continue to live on the island, and their stories are their history. Mr. T was only to happy to regale a story which had me in stitches. Aborigines made use of various different types of plants and trees, for both medicinal use, and for making everyday items such as baskets, weapons and rafts. Many of the plants are poisonous though, so how did aboriginal tribes figure out which plant concoctions would be poisonous, and which ones wouldn't be? "Trial and error", answered Mr. T. "Essentially they would feed them to grandma. Their history is stories. Once those stories are passed on to the next generation, grandmas job in the community is done. So they use her for testing toxic potions. Grandma would also be the first to be made to cross crocodile infested waters, to see if she actually made it across." Being a sand island means only certain plants and wildlife can survive on the island. 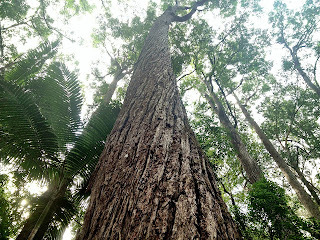 But it turns out there are many important trees and plants on Fraser Island. Awesome Thing Number 4 - Nature. In 1925, the Satinay tree became the major timber logged on the island after it was found to be resistant to marine borer. This meant the wood was highly resistant to salt water, and thus became popular for use in marine conditions around the world. For instance, this timber from Fraser Island was used rebuild the London Docks after World War II. Fraser's famous Satinay trees - just like a giant Cadbury Crunchie! There are over 300 types of eucalyptus trees across Australia. The Aborigines would use eucalyptus trees for medicinal purposes - for example they would use the sap from the tree to numb their mouth if they had a toothache. "Blackboys are also useful", started Mr. T, catching everyone's attention...many with mouths aghast at his comment. "Well, we can't call them blackboys any more because of political correctness, but grass trees (mouths finally close) are a useful plant too. They grow small fruit seeds. Aborigines would heat these fruit seeds up and they turn into a substance similar to plasticine. They would then use this to fix arrow heads and knives onto the end of wooden sticks to made weapons. Once the plasticine cools, it becomes rock solid. Perfect." On the second day of the tour, we ploughed ahead to the beach. The tank was flying through the sand tracks, and occasionally met another vehicle coming the other way. Mr. T wasn't budging, to the slight annoyance of a few non-touring 4x4 drivers. "I love being bigger". No messing with Mr. T! Awesome Thing Number 5 - The Maheno shipwreck. Half way down the 85km stretch of beach on the east side of the island, you will find The Maheno shipwreck. Currently 60% beneath the sand, Mr. T told us the history of the shipwreck. "It was made in Dumbarton, Scotland, and was once of the fastest ships made around that period. It was built with a huge steam engine, and did 18 knots, more than most ships around that time. It was used as a medical ship in World War I, and was eventually sold to a Japanese company in 1935. To save themselves some money, the Japanese decided to tow the ship from Australia to Japan, but ran into a cyclone, the tow rope broke, and it ended up being beached here, at Fraser Island. The Australian Air Force used it as target practice for World War II....and hit it once, which says a lot about our Air Force. A special Aussie commando unit also use it to try out their new toys on, which always blows a few more holes in it, which is another reason its 60% under the sand. The rest will probably be devoured by the beach in the next 10 years." By this point I was hanging on every word. We carried on driving. Earlier in the say, Mr. T had mentioned that we could catch a flight to see the island from above, so I assumed there was some sort of flat grassy strip with a little orange wind sock further along the coast. How wrong I was. Awesome Thing Number 6 - Fraser Island is only the second place in the world where you can catch a flight that takes off and lands on the beach. The main stretch of beach was also given speed restrictions a few years ago, which technically classifies it as a state highway. So in effect, this is the only place where a plane lands on a certified road. 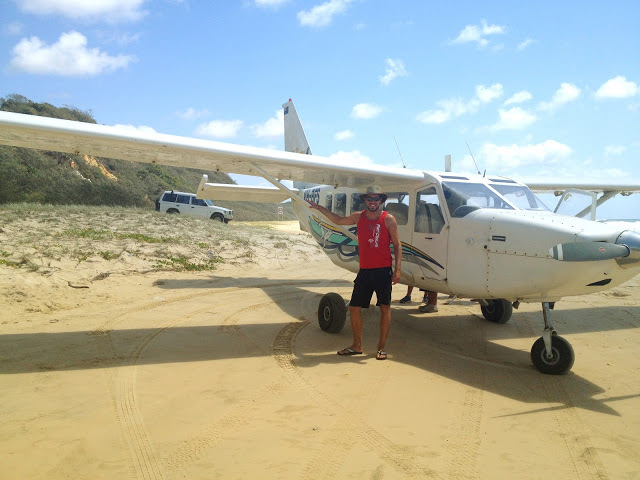 'How many times are you going to take a flight from a beach? ', I said to myself. Ten minutes later I was sat behind the pilot, with the iPhone camera video rolling. Only in the air can you really understand the true size of the island. It is massive. To give a UK comparison, the length of the island is almost the same distance between Cambridge and Brighton, or Edinburgh to Aberdeen. We had to time the landing well, as it was almost high tide with not much beach remaining! We landed safely, and headed back to the tank. We made it to Indian Head, swan in the champagne pools, sprinted back along the beach at low tide, and before we knew it, we were having final beers in the infamous Dingo Bar. 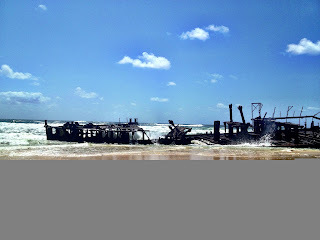 I didn't really know what to expect from Fraser Island before I arrived. I just knew it was a 'must' if I was travelling down the East coast. Well, thanks to the soundbites and stories of Mr. T, I can say it is well worth a visit, and certainly a highlight of my Australia trip. Click here to read Simon's original post or follow his Jamjar blogs and life observations (Blog and images were reproduced with the author's permission on 05/02/2013) and why not follow the adventures of our Cool Dingo friends on our Facebook page? Like what you see? The albums on our website are REAL guests enjoying REAL adventures on the world's largest sand island!